So I joined my second organised run this year and my first since July's Jurong Lake Run. That was 6km. For yesterday's Pioneer Road Run, I ran 10km. Actually, it was only about 9.8km according to my iPhone running app, although it was advertised as 10km. At the finish line, I was given a finisher's medal, a can of 100 Plus and a banana. A banana? Yes, a banana. I was surprised because I did not get a banana or any other fruit at the Jurong Lake Run, where I got a finisher's T-shirt, which I prefer because it's non-perishable. It was a nice banana though. The Jurong Lake Run was a much bigger event just in terms of number of participants. It was also more pleasant running around the lake than running around the industrial area along Pioneer Road. There's nothing like the smell of pollution in the morning - while you run. The first Pioneer Road Run also had too many traffic junctions along the race route, much of which was narrow sidewalk. The organisers didn't even close the roads. 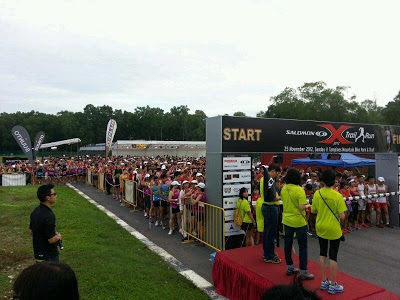 Too bad I've limited my options by choosing to join only 10km events not too far from my home in Choa Chu Kang, which is one reason I didn't sign up for the Salomon X-Trail Run also held yesterday morning. That looks like more fun, but it's all the way in Tampines. Next Sunday is of course the big one, the Standard Chartered Marathon, which is way out of my league and my Choa Chu Kang area. For now, this is me at the Pioneer Road Run starting line. If only the back of the shirt is true. The road fears me? I think the road has better things to worry about. UPDATE: I came in at 92 out of 305 in the 10km men's category.